This popular book has also been revised and now features fun tunes in the original version plus several entirely new ones that are designed to build confidence. The free CD contains new backing tracks at both performance and practice tempo. 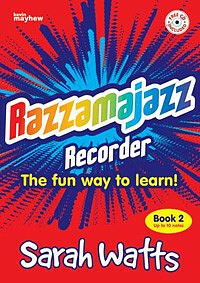 Razzamajazz Recorder Book 2 by Sarah Watts was published by Kevin Mayhew in March 2001 and is our 19112th best seller. The ISBN for Razzamajazz Recorder Book 2 is 9781840036800. Be the first to review Razzamajazz Recorder Book 2! Got a question? No problem! Just click here to ask us about Razzamajazz Recorder Book 2. Now Playing: Hairy Scary Your browser does not support the audio element.